A mixture of delightfully refreshing and painfully stale, Lu Over the Wall is a film that shows flashes of greatness but never really comes together as a definitively above-average film. Just like its lead character, Kai, Lu Over the Wall spends a lot of its time going through the motions. While much of this movie is uniquely displayed from a visual standpoint, most of what’s being conveyed is an obvious plot-line told through point-blank dialogue & characterizations. Simplicity is sometimes to be expected from cartoons but Lu Over the Wall plays its narrative hand so plainly that it may have its viewers bored before the halfway point. The playful direction and cinematic choices of this movie may help hold the attention of its viewers but, due to Lu Over The Wall‘s meandering pace, I would not be surprised if some will be eager for the ending. There is beautiful, frightening and humorous imagery in this movie and enough overall quality that I would say the film was an enjoyable experience. But there is also enough fat along the way that I won’t be eager to experience it again. 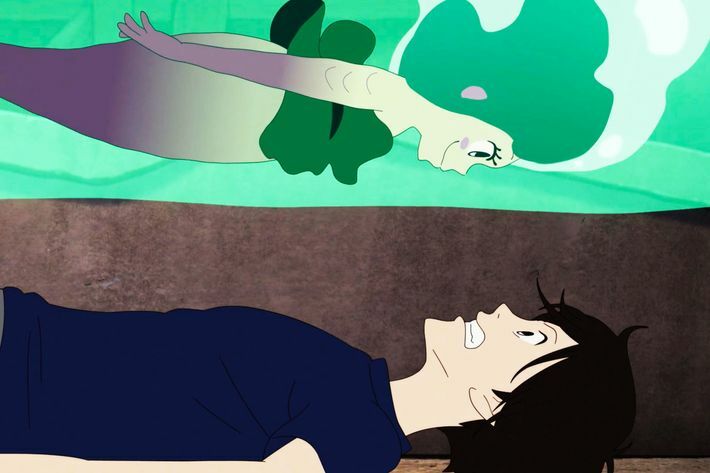 In the end, Lu Over the Wall‘s combination of ancient folklore, modern music and striking images gives it a special feel that is, unfortunately, overshadowed by its limited script.